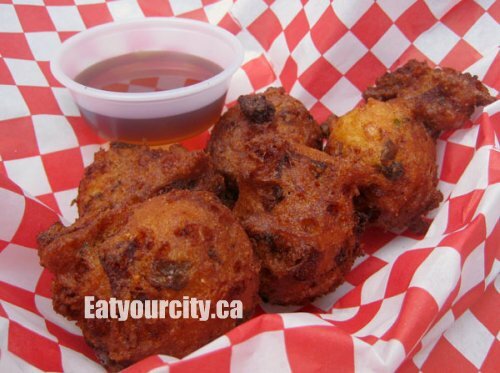 Eat Your City: Calgary Stampede & Edmonton's Capital Ex Carni food! Calgary Stampede & Edmonton's Capital Ex Carni food! Its that time again... Calgary's own Stampede followed by Edmonton's Capital Ex!! Which means we can let our inner child out and eat the mother of all artery clogging irresistible foods... Carni-foods!!! Its time for sugar coated mini donuts, corn dogs, elephant ears drenched in cinnamon sugar, freshly squeezed ice cold lemonade, apple wood smoked turkey legs eaten Fred Flintstone style, multiflavored mini icecream dipping dots, whirlwind fries, pizza on a stick - a stick wrapped in dough, with toppings stuck on outside, pocket dogs... I can feel my heart clenching already just thinking about the super greasy, deep fried savory and sweet Carni-food that we all indulge in before we go on the stomach queasiness inducing rides. 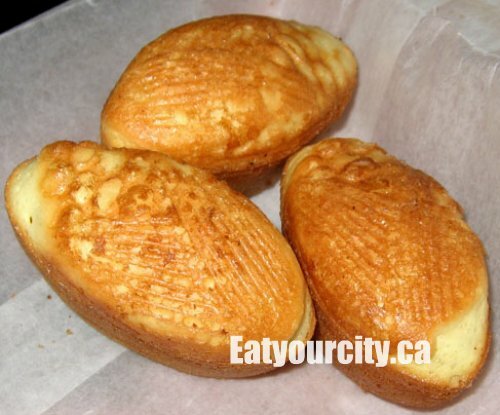 Not a new Carni-food, but one of my favorites, with the exterior cakey, and the interior a molten gooey vanilla creme. Yom. Heading over to a stand manned by a very grouchy guy, we waited in anticipation as the cast iron molds release their aromatic and mouth watering contents. The recipe has changed over the years, and though it wasn't the best I've had, it wasn't dry and overcooked, with just a little molten vanilla goo with a custard like texture on the inside. Hot, soft, sweet vanilla-y sugar rush... $1.50 for 3... Mmmmmm. 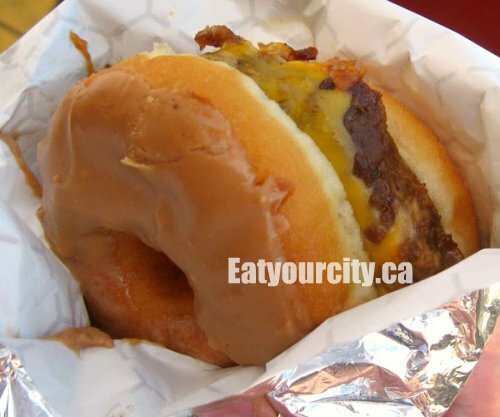 A donut burger?! Is it a candied sugary confection, or a meeting of both salty and sweet? Intrigued by a picture of a honey glazed donut acting as a bun with some lettuce and tomatoes peeking out of it, we order one to try. Wrapped in tin foil paper wrappers, the creators didn't think too far in the execution...the glaze from the donut sticks to the wrapper, and is difficult to bite into the burger without getting some wrapper along as fibre. The burger patty is disappointingly mushy - far more breadcrumbs than meat, and completely unseasoned = not flavorful. There was no tomato or lettuce as advertised in the picture, and it came with a maple glazed donut instead of a more neutral flavored honey glazed donut. This was definitely sold more as a novelty item as it was $8 for the plain mooshy burger, and $1extra each for cheese, or bacon. 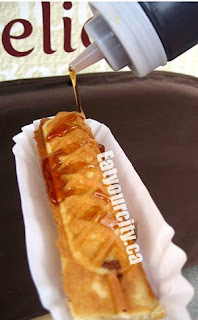 Breakfast on a stick? Sweeeeet! 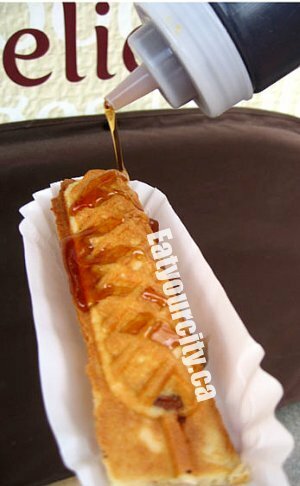 You get a choice of a hotdog or 2 breakfast sausages or bacon tossed into a waffle maker... the meats are baked into a waffle with the batter coating the meats like a corndog. Close enough for Carni-food, especially with a stick inserted into it so you can walk around and eat it at the same time. The waffle wasn't the greatest - no vanilla flavor and not fluffy inside, but crispy on the outside. Ordering the sausage waffle, I expected a large sausage, not the 2 breakfast sausages that came tucked inside the waffle. There was no pictures of the sausage waffle, and I guess in retrospect, you really can't put a big bratwurst into a waffle maker and be able to successfully close it. There are 4 self serve sauces in squeeze bottles to choose from: mango hot sauce, maple syrup, ketchup and mustard. We put on the syrup... it was like eating a soggy pancake sausage. Eaten alone, it would be very dry, but when drenched in maple syrup, it literally tastes like breakfast on a stick... and I loooove drowning my brekkie sausages in syrup... introduced to me first by my boyfriend. It should have its own religious following... seriously, try it, and you'll convert hahahaha! At a booth named Hot Tennesee Cheese, which served all sorts of cheese related products - battered and deep fried of course... this is Carni-food! While mozzarella is common, this was my first time experiencing deep fried cheddar cheese nuggets, so we tried several varieties at this booth. 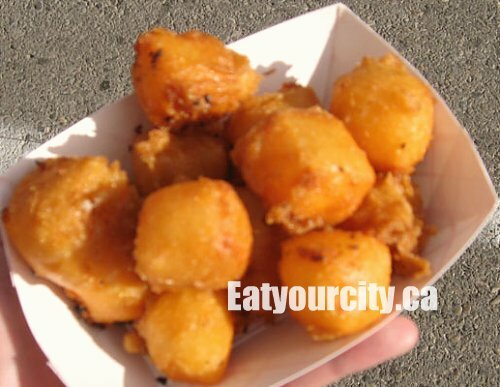 The cheddar nuggets were simply cubes of mild cheddar cheese dunked in batter and deep fried to a light golden piece of yumminess. Gooey and melty, the light crunchy batter was super garlicy. When you dunk them into the pizza sauce.... Hoooooh! Definetely worth it for $8. Excuse me, but we need some time alone... me and these golden nuggets of cheese. Nom! At the same Hot Tennesee Cheese place, we grabbed some mozza sticks to round things out. These turned out to be run of the mill mozzarella sticks dunked in batter and fried. The thin batter had hint of garlic and the six sticks came with choice of sauces - hot sauce, pizza sauce (the best one as it was smooth, tomatoey and garlicy) as well as ranch sauce. They were surprisingly not stringy as I expected from mozzarella cheese centres, but they were satisfyingly melty and gooey.. not a bad deal for $8 at Hot Tennesee Cheese. We didn't get to try the jalapeno cheddar sticks, as they accidentally gave us a second order of mozzarella sticks instead, and we didn't realize it until we dug into them. 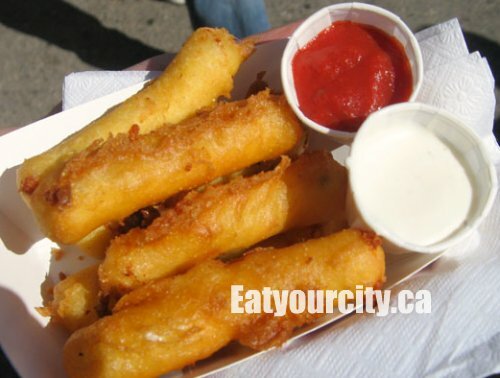 Ah wells, nothing wrong with more deep fried cheese sticks in my books. One large white onion the size of a grapefruit with its top and bottom cut off, put thru a slicer to look like a lotus flower. Then battered, jiggled and fried... core out center so there is room for the sauce and the onion segments fall into easy to pull off pieces, and you have the makings of a Colossal Onion for $10. 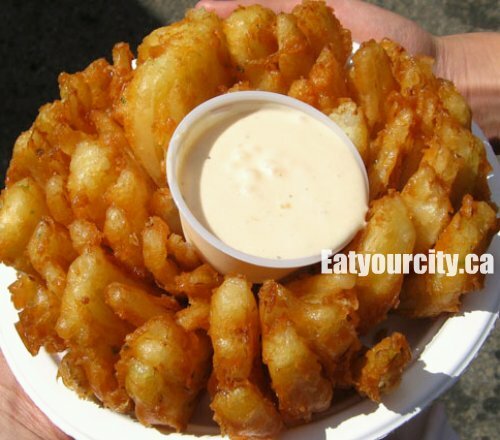 The batter is thin, oily, crunchy and surprisingly flavorful from the huge sweet onion and seasonings in the batter. It came with a tangy orangey colored sauce - chipotle I think... we were too busy attacking the onion. When cored properly, the onion fans out nicely and each battered piece segments like an orange... when some of the onion isn't cored well, you get a huge greasy lump thats near impossible to rip off to eat. We also learned you better eat it fast or it becomes a greasy mess. Still.. giant fried onion ring times 100.. Mmmm! You can also get sides of beans, and grilled corn on the cob.. but its sooo much fun and strangely satisfying to bury your face into this turkey leg like a caveman. You can get a regular, large, or jumbo sized leg if you don't think you can finish a super jumbo. This is typically only available at Stampede as we've always looked for it at Capital Ex... so get them while they last.. or you'll have to wait a full day before the next batch smokes to perfection. Chomp!! I looove bacon. Songs, poetry and near rabid fans follow this humble slice of smoked side of pork. So when I heard there was a double smoked bacon on a stick to be found at the Bull's Eye Cook Shack, I immediately headed over for well.. bacon a stick! Mmmmmm.. a smoking hot stick loaded with 4-6 pieces of thick cut bacon skewered on a wooden skewer. We lost count as we were too focused on the bacony goodness. 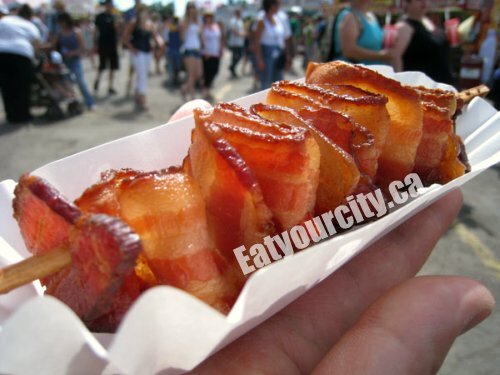 The edges were a nice crunchy crisp, with the center of the pieces a tender melt in your mouth bacony NOM! The double smoking gave it this sweet bacon a nice hit of smokiness... and while we enjoyed our bacon, we had plenty of people giving us jealous looks. For only $2, you can indulge without hurting your wallet. Nom! Kubi Kornballs at Maggie's Kulbasa... these little corndog batter balls had little chunks of diced smoked ham, jalapeno peppers, laced with a bit of cheese inside... and deep fried to a deep golden brown. It was like biting into a smokey ham corndog.. minus the weenie. The ham added in a big hit of salt and flavor, though the cheese and jalapeno peppers surprisingly didn't add to much more to these little deep fried dough balls. The vendor encouraged us to dunk them in breakfast syrup - which made these kornballs taste like a miniature version of breakfast ham and taters smushed together and drown in syrup. Worth a try. 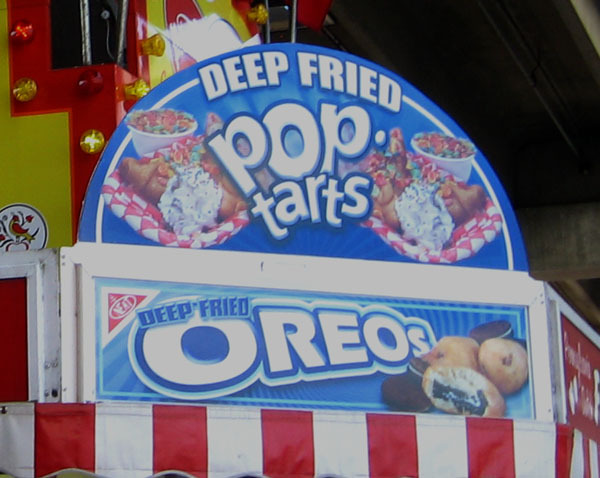 We ran out of room to try the deep fried Oreos and Pop Tarts, but there are a couple more days of Stampede... before the party moves to Edmonton for Capital Ex. We never did find the Turkey-tinis, but I'll see you later my deliciously deep fried Oreo... soon my precious... soon! Heehee! So along with most of the carni-foods available at the Stampede on the fairgrounds at Capital Ex, Edmonton also has Sip! 2011. Sip! the "wine and food experience" is found next to the casino portion with foods paired with vino and specialty beers. This year the theme is "patio" with plenty of finger foods and tasty booze to smooze.. with over 50 liquors, 30types of beers, and releasing a new sparkling wine, rum, and 5 vodkas... Sip! This was the American Road House budlime marinated smoked brisket station. It come with a side of grilled pita, laced with kansas city bbq sauce and a salted bean coleslaw. I could smell the smokiness from where I was standing. This acrobat from Firefly Theaters was positioned right in front of a booth serving wine - she does a scheduled champagne/sparkling wine service, but if you ask nicely, this lovely lady may pour you a glass of vino... whilst hanging upside down by a scrap of fabric. Too cool. We sampled some coolers made with Jack Daniel's... a cola version - like a rum and coke, a lemonade version which tasted like a spiked European brewed lemonade, and my fav of the night - a gingerale version which while having a light ginger taste, still packed a nice smooth Jack Daniel's kick and flavor without being too strong. The other two pictured are a margarita with tequila and a paloma (popular Mexican cocktail) also with tequila from El Jimador. Will have to keep an eye out in the liquor stores for these to try later.. Yumyum! The best part is, for every monster burger sold, 1kg of beef is donated to the food bank! So we're eating for a good cause. A close to $40, this monster burger feeds 6-8 people, 4 if you're really hungry, and well, if you've worked up a massive appetite, last year they gave out t-shirts and the burger was on the house for finishing the burger as part of the Monster Burger Challenge (not sure about this year - didn't see any super full looking fellows walking/waddling away with a free t-shirt, and didn't see anything mentioning the Monster Burger Challenge).. so you can just eat for a good cause. This year, for some reason the onion straws are on the bottom isntead of at the top where the cheese melting can hold it together rather than have the entire burger being very unstable. Its not as tasty as it was last year as it was missing the tangy bbq sauce the burger was slathered in, but the burger was still juicy and flavorful with minced bits of onion inside (new addition) and big enough to satisfy most hungry folks. Order some fries on the side if you're sharing for a complete meal - last year it was complimentary, this year it wasn't... nosh on a giant pickle and sweet pepper/giant pimento the burger is crowned with, and wash it all down with some ice cold pop, ice tea or beers.. *burp*. After letting this massive burger settle, we strolled off to find some cinnamon sugar dusted super hot tender mini donuts for desert. Hey... Capital Ex only comes for 10days a year. Enjoy yourself! 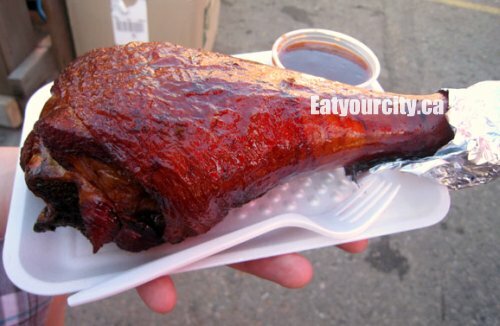 Update - the jumbosized turkey leg IS available at Capital Ex!! Look for the roasted corn stand. Woot woot! Just make sure you grab lots of napkins. YOM! !